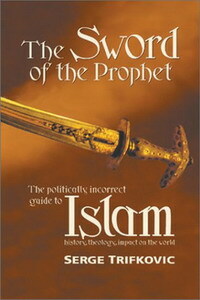 The book The Sword of the Prophet written by Dr. Serge (a.k.a. Srdja) Trifkovic of Serbian extract, is similar to many such post-Cold War era books (written by pseudo-experts like Judith Miller & Co.) that are written to keep alive the perceived “threat” of Islam before our eyes, while guaranteeing themselves profitable fees, consultancies, recurrent appearances in TV and lucrative book contracts. To these bunch of bigoted, eavesdropping, lying and self-promoting journalists, in these days, especially after 9/11, there is no better and easier way to draw attention and sell books than to demean and dehumanize Muslims and Islam. It does not take too much insight to find common grounds that motivates these bigots. Serge Trifkovic, a graduate of the University of Southampton, UK, is identified as one who pursued a post-doctoral research at the Hoover Institution, CA, and then worked as a TV broadcaster and later as a journalist covering southeast Europe for the U.S. News & World Report and Washington Post. He is a frequent contributor and, since 1998, foreign affairs editor to the Chronicles: A Magazine of American Culture, where his Serbian ultra-nationalistic stand is easily discernible. It is not clear if he had visited any Muslim country, outside his native Serbia in former Yugoslavia, a state that was guilty of ethnic cleansing of Bosnian and Kosovar Muslims. His field of study had nothing to do with either the people or the religion that he writes about in his hate-book The Sword of the Prophet. Yet his ignorance did not dissuade him from venting his venom against Muslims in this spiteful and inaccurate work. What qualifies Trifkovic as an “expert” on Islam today? In the Foreword to his book, he himself confesses of his hatred or as he mildly puts it “lack of a priori admiration” for Islam. As one may also recall, during the genocide of Muslims in the Balkans, he tried to defend the case for his murderous Serbian leader — now being tried for crimes against humanity in The Hague. While the whole world saw the savagery of the Serbian Christians against unarmed Muslims in Bosnia, he blamed the victim Muslims by stating that the latter had brought it down upon themselves through “self-inflicted atrocities and stage-managed massacres.”1 What a criminal and sick mind to invent something like this! In a keynote speech at the Ball Union League Club, Chicago, in June 7, ?96, he dared to equate the genocide as honor-killing by stating that “Bosnia is honor, and Yugoslavia a tragedy, but there was no ‘holocaust’.” To him, the total tally of Muslim victims in Bosnia was not 250,000 (as stated by President Clinton, addressing the nation on Nov. 27, ’95), but could have been as small as only 2,500, i.e., a mere 1% of the reported casualty.2 He actively condemned the jurisdiction of the Hague Tribunal (ICTFY) that was established by the Security Council of the UN in 1993 on the basis of Chapter VII of the UN Charter (Resolution 827) for investigating crimes against humanity in former Yugoslavia. He also opposed the deployment of NATO and UN forces in the Balkans to stop the ethnic cleansing of Muslims. When his propaganda failed to dissuade the Clinton Administration, he disappeared from spotlight for some time until the tragedy of 9/11 occurred. When he surfaced this time he came up with his Mein Kampf. That basically sums up a very disturbed and sadistic individual with a desire to settle old scores. It is said that falsehood oft repeated achieves the veneer of truth and some are sure to swallow it. Trifkovic’s The Sword of the Prophet is a typical example of such an attempt at disseminating falsehood with doggedness and cruelty. A collection of lies and half-truths, many fuzzy facts, quite a few obsolete and unreliable sources and mindless anecdotes, and a plethora of imagination and false interpretation, therefore, forms the nucleus material for the above work. His hate-book demonstrates his belief that, in the post-Milosevic era, it has fallen on shoulders of ultra-nationalist Serbian zealots like him to carry the mantle of Milosevic, Karadzic & their gang of sub-human brutes to finish their yet unfinished business through misinformation campaign what the half-decade long extermination campaign could not achieve physically in the battle field. It is no wonder that in this endeavor he is aided by all the bigots – from the pujaris of Hindutva (who want to cleanse India of non-Hindu minorities) to Zionists (who want to justify the annexation of entire Palestine by uprooting Palestinians) — as is reflected in several websites belonging to these latter hate-groups which routinely post his lies and distortions. Truly, the fascists, racists and bigots have discovered a prized comrade in their common crusade. In order to assess Islam and the Muslim world, areas that are unfamiliar to him, Trifkovic uses the writings of discredited journalists and ex-Muslims — whose motivation was nothing honorable either. Such arguments hardly carry any conviction. Truly, the work epitomizes his intolerance against Islam and Muslims, and in that process reveals nothing but his ‘anti-Muslim paranoia and bigotry’. He quotes his peers like Judith Miller and Ibn Warraq voraciously in his book. Because that is the level of his learning or education on the subject he dared write about. Books like Judith Miller’s “God has ninety-nine names” are symptomatic because, as Prof. Edward Said of Columbia University had rightly pointed out, they are “weapons in the contest to subordinate, beat down, compel and defeat any Arab and Muslim resistance to U.S.-Israeli dominance.” In her book, Miller shows her pro-Israeli, pro-Phalangist (a fascist organization) bias against the uprooted Palestinians. She disdains facts. She prefers quoting endless talks to justify the marauding activities of the Israeli apartheid government and the U.S. support of it. Israel’s war against civilians is simply buried in reams of chatter. Despite her knowledge of violent activities by right-wing Jewish fanatics, she deliberately omitted their murderous acts and promised, instead, to write a book on right-wing Judaism in Israel. It has already been more than six years; still we have not seen that book and probably never will. And when did Miller became an “expert” on Islam? Truly, her work resembles the work of a name-dropping university student, who begins with an anecdote and then moves to a potted history. She cites unreliable sources that cannot be verified. Her footnotes only prove her ignorance, lamentable prejudices and failures of comprehension. In her summary on the life of the Prophet of Islam, she does not quote one Muslim source, – none of the classical biographies of the Prophet. I wonder if Simon & Schuster, her publisher, would allow a book on Jesus or Moses that does not make a single mention of Christian or Judaic authority. But such pseudo-scholarship, hate literatures are now kosher when it comes to Islam. One wonders what are we coming to in this age? After reading her book, one wonders why she truly wrote this book? After all, she confesses that she dislikes all the Arab countries for one reason or another. She does not mention a single thing she loves about the people she wrote about. Arabs have a quality to be open, welcoming, to think well of others, to be hospitable and courteous to their guests. She seldom has a good word for their hospitality. She neither had the nobility to return the courtesy shown to her nor the decency to respect truth and to be as impartial as possible in her evaluation of Muslims. Truly, hers is an epitome of betrayal of trust. Her book is a pathetic display of a deeply partisan journalist, a hostile combatant, who does not and cannot communicate with the people she writes about – the common mass, listen to their conversation, read their books, listen to their music. Yet she has no problem poking fun at the people she met, the history and culture of a place that to her is one long saga of jumbled rage and resonance. In summary, as Prof. Said correctly pointed out, Miller is a shallow and highly-opinionated journalist whose voluminous work is unnecessarily too long and short on facts, analysis, structure and reflection. Trifkovic tactfully forgets to share with us the fact that the concept of Trinity is nowhere propounded within the so-called Old Testament and that Jews also reject the concept of original sin and vicarious atonement – concepts that they find repugnant and arguably pagan in origin. His cynicism reveals his blatant Orthodox Christian leanings. In the Mosaic story about Samiri, who lured the Children of Israel into cow worship, he confuses Samiri with the Samaritans, who, according to the Biblical narrative, were implanted into Samaria after the Assyrian conquest (in the 8th century BCE). In his jaundiced view, he fails to see the similarity in how child Moses (Ar. Musa) was cared for in his infancy (Exodus 2:1-9). He doubts the Islamic version of sacrifice of Ishmael (Ar. Isma’il), but has no problem in accepting the Hebrew Biblical version in Gen. 22:2, where it states, “Take thy son, thine only son Isaac.” How is Isaac the only son of Abraham when he was born 14 years later than Ishmael (see Gen. 21:5, 17:25, 16:3)?8 Trifkovic questions the Arabic names for idols of Noah’s time but has no problem accepting Anglicized names for his lord Jesus, or for that matter any of the Biblical Prophets. Did Jesus (or any of the Biblical Prophets) speak English or any of the European languages? What a selective understanding and thoughtlessness! His arguments are so silly and ridiculous on all such matters that it does not warrant reviewing each of those points. His knowledge of Islam is incredibly flawed, weak and childish. From India to Spain, the brilliant civilization of Islam flourished. What was lost to Christendom at this time (699-1000) was not lost to civilization, but quite the contrary. Trifkovic, in short, is typical of the cynical anti-Muslim hawks. His book is trash and falls under the category of hate-books. It implants prejudice and harvests hatred. Naturally, in the aftermath of 9/11 his capacity as a “pen-pusher” has endeared him among Muslim-haters and Islam-bashers. We learn from history that fascism is always preceded by carefully concocted ideological distortions. It is writings like these that make our world more divided than ever before. Robert Spencer requested Karen Armstrong for a dialog on Islam. Anyone knows when it is taking place? Bible is the book KKK and NANI not GOD ! Read : http://islamplanet.jeeran.com/.....peace.html Is bible the book of mercy and peace ?? http://www.islamherald.com/asp.....rowing.asp Who says that Islam is the fastest growing religion on Earth ?? Some people say that Islam was spread by the sword. What is the sword of Islam now that so many people are compelled to embrace this faith? Here are some excerpts from reputed news services around the world. “The salient point is, the following are not verse that I cite alone! In a constant stream, Islamic leaders such as al-Zwahiri, Rahman, Osama, and a myriad of others, not only call for the death of unbelievers, but they justify it by citing the Qur’an and the Hadith. So Caner seems to be arguing that Islamic teachers do teach the murder of non-Muslims. I am unaware of Egrun Caner or those remarks, so I can hardly make any sensible comment on them. May I ask for a source that I can check and so I can get back to you? For what it is worth, I do not think Islam exhorts its believer to kill all infidels. At least not all the time. Just too often. Hagoo:Actually such arguments, especially from ex-Muslims, are highly convincing. Do you agree with Egrun Caner’s remark that Islam does not exhort its believers to kill all infidels? A good question. What qualifies someone like Karen Armstrong except, of course, that you like her message and favorable views of Islam? Can we agree that in your eyes an “expert” on Islam is someone who agrees with you? Actually the whole world did not see Christians do any such things. They saw Serbian nationalists, Croat nationalists and Bosnians or various ideological persuations do such things. Who knows what sort of sick mind invents such things but some sick minds do – as some Muslims in Iraq have done recently by claiming some Shia burnt some Sunnis to death. Some Muslims do, in fact, frequently invent such stories. Are you sure you heard him properly? It is more likely he said “Bonia is a horror”. That would scan properly. Your credibility goes out the window when you say this sort of thing. As we can all see, you are no different from the man you attempt to smear. Why don’t you put forward a sensible case for why he is wrong rather than trying this sort of gutter smear? “Discredited” by who except you? You mean journalists you do not agree with. Again you do not deal with the argument but attack the man. This is utterly foolish, unconvincing and frankly childish. Suppose everything you said was true, *his* argument would remain unrefuted whether he was a mass murdering child molestor or not. To defeat an argument you must confront the argument, not simple smear the man. Actually such arguments, especially from ex-Muslims, are highly convincing. Well they like to think so, but who is stereotyping an entire culture and people here? Where is the evidence that Arabs actually live up to their ideals? Arabs also have many other qualities as well. Why do you only select those you approve of? Just as you, and the other Muslims here, have little good to say about the West and its enormous generousity to the world and the West’s Muslims. She has a primary obligation to tell the truth even if it goes against nobility. Good for her. What evidence do you have that she did not respect the truth and was not impartial? Again you seem to play the girl, not the ball and judge all truth by whether you like it or not. Why do you think it deserves such respect? For example? Why does that follow? Of course the Church has problems with the Trinity – they agree entirely with Gandhi – it is contrary to all reason. But that does not mean that it should be, much less is, rejected. Islam also has problems with understanding God. So what? Nor do you explain what his problem with the Muslim God is. Clearly it is not the Christian God although it may be the Jewish God. So what? And what qualifies H. G. Wells to talk about Islam except that he agrees with you? And what qualifies Gandhi to talk about Islam except that he agrees with you? And what qualifies Shaw to talk about Islam except that he agrees with you? And that quote is likely faked by the way. And what qualifies Michener to talk about Islam except that he agrees with you? And what qualifies Russell to talk about Islam except that he agrees with you? You need to spend more time reading what people say and thinking about why they do so. Not wasting all our time by personal attacks and insults. None of us have a clue about anything ST said because you have not bothered to attempt to begin to refute a single arugment he made. Calling someone a son of a b!tch does not make him wrong.